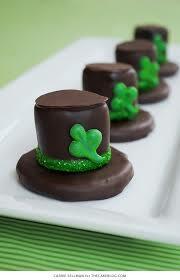 Need ideas for your St Patrick’s Day theme? Why not choose one of our St Patrick’s Day coasters for your special event? This blog is about modern day St Patrick day celebrations. Read on, it may give you some ideas…. Saint Patrick’s Day coasters are a must for your Saint Patrick’s Day celebrations. 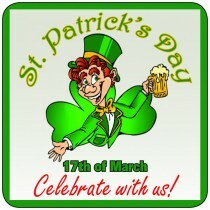 This day is a global celebration of Irish culture on March 17. It particularly remembers St Patrick, one of Ireland’s patron saints. 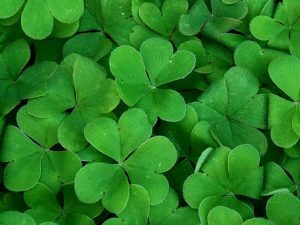 ♣ What happens on Saint Patrick’s day? 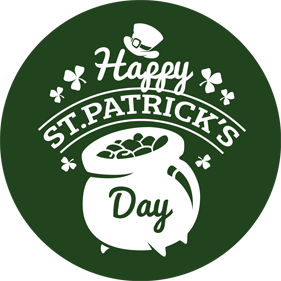 Saint Patrick’s Day is celebrated in many parts of the world, especially by Irish communities and organizations. Many people wear green on the day. Parties showcasing Irish food and drinks are part of this celebration. # The most common St Patrick’s day symbol is the shamrock. The shamrock is the leaf of the clover plant. # Many people choose to wear the colour green. # The Irish flag is often seen in Saint Patrick Day parades. # Guinness an Irish brand of ale is popular on St Patrick’s Day. # Ireland is referred to as the Emerald Isle due to the lush green landscape. # The Celtic Cross is a reminder to all believers that it is okay to celebrate nature. # Tradition says that St Patrick used the three leaf shamrock to explain The Trinity to the Irish people. Each leaf represented the Father, the Son, the Holy Spirit. # Irelands’ national flower (the shamrock) is a reminder of its’ Creator and the wonder of the Trinity. Use our generic coaster or create your own. Unleash your inner artist and stencil, stamp or draw 3 heart shapes in a circle (shamrock) with a line (the stem) to make a 3 leaf clover on our plain round stock coasters. Packs of 8 from $5.00 includes postage.